Q: Where & when was the first Disability Pride parade? Many people associate Chicago with the start of Disability Pride Parades; however, years before Chicago, the first Disability Pride Day was held in Boston, Massachusetts in 1990. The Boston Disability Pride Parade was held again in 1991, but ended after that due to the death of lead organizer, Diana Viets, and with the move of co-organizer Catherine Odette to Madison, WI. 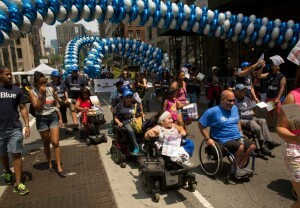 The next Disability Pride Parade was held thirteen years later in Chicago. Organizers expected 500-600 people to attend the event – almost 2,000 attend! Disability Pride Parades have subsequently been held in many cities throughout the United States, usually coinciding with Disability Pride Week. The goal of the parades is to change the way people think about and define disability, to end the stigma of disability, and to promote the belief that disability is a natural and beautiful part of human diversity in which people living with disabilities can take pride.